Greetings fellow moonies! I have some good news to report on the career of Shoko Nakagawa. 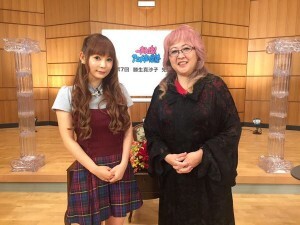 The famous multimedia personality, who has ties to Sailor Moon thanks to her portrayal of Diana in the recently aired “Crystal” series (and is an overall fan of the series), has landed a new hosting role on the TV show “Shumi Doki” (an educational variety TV show on Japan’s NHK E channel). “Shumi Doki” is a well-known program in Japan that allows its viewers to examine various pastimes, and it will be offering a new segment on a cram school featuring prominent anime voice actors, who will cameo on the show as instructors. Nakagawa will play the class president and host the segment, and the talent that appears on the show will make voice acting an attractive career choice for viewers who watch. The Anime Voice Actors segment will air over the months of August and September, and will examine the occupation in depth with the help of a variety of professionals who have made a career out of voice acting. Masako Katsuki, who voiced Sailor Neptune in the original classic Sailor Moon anime series, will be appearing on the episode that is airing on September 15, 2015. Former Sailor Moon voice actors who have appeared on previous episodes of the show include Akira Kamiya (the voice of Dr. Souichi Tomoe) and Shigeru Chiba (who appears in SuperS episode 145 as Kurumiwario). In July, NHK published a book full of the voice actors’ tips and techniques to compliment the segments airing on TV. Masako Katsuki has been acting since 1982, and among a long list of achievements has also provided the japanese dub voices of Julia Roberts, Sharon Stone, and Jodie Foster. She has also served as a lecturer in voice actor courses at Tokyo Animation College. It seems that some clips of previous episodes have made their way to YouTube, and we will update this post with a link when we find one. MC: When approximately will Sailor Mars, Jupiter and Venus be up for order in North America? B/TNUSA: Generally, the pre-order window begins about 3-4 months before the month of release. MC: Will there be an Artemis figure included with Sailor Venus? B/TNUSA: Likely, however that information is unavailable at this time given that figure’s release’s is still far away. MC: Is there a Tuxedo Mask figure in the pipeline or are there only the heroines being produced? B/TNUSA: That cannot be answered at this time. MC: Will the SD/Chibi keychains be available in North America or are those Japanese exclusives? MC: Do you know if there is a Sailor V figure being planned? MC:. Do you know of other figures being planned, such as the Outer Senshi (Sailors Neptune, Uranus, Pluto, and fan-favorite Saturn) or Princess Serenity? MC: Do you know if either Bluefin/Tamashii Nations, or any other North American company affiliated with Bandai Entertainment will be releasing any of the Japanese Premium Bandai products in North America? B/TNUSA: The Bandai Premium situation is somewhat complicated, we for example are selling only a select number of Premium items such as those from Dragon Ball Z or Godzilla or Power Rangers/Sentai based on demand. If there are S.H. Figuarts Sailor Moon items from the Premium Bandai shop (Tamashii Web Store) we will have those available for the U.S. as well. There is more news regarding the new S.H. Figuarts Sailor Moon figures, as pictures of the final finished figure for Sailor Moon have been released. Please click here to see pictures of the figure!